The nagging questions have always been “What’s Ann’s maiden name?” and “Where in England?”. We had two possible options: William to Ann Wood in London or William to Ann Chaddock in Lancashire. Figuring out which one was ours would provide the location. 99% of the family trees I had seen claimed Ann Wood. I had her in my family tree for some time as hers was the only record out there and I hung on to her for research purposes. Sadly, during that era, I’m as responsible as everyone else – I should have just kept her in a research folder, but I was using my Ancestry tree for leads not realizing everyone took my tree as gospel. So down she came until I could dig into the records. In researching Ann Wood, who was supposedly married to William Brimlow in London on 5 Mar 1819, I found no true source record for this marriage. What I found were multiple unsourced family trees and some old IGI and One World Tree references with these names and this date, but no actual marriage record. Not that this means it doesn’t exist since there are many records not yet online and some of the search engines are pretty crappy at turning up things that are actually there. What it means is that I didn’t locate it. Even without a marriage record, I elected to search for the birth/christening records of the 5 known children in London and found a record for a George Bromley, but his birth was Feb 1819 (a month prior to the supposed marriage), and his mother was a Sarah Ann. FamilySearch is big on giving you a list of people with “sounds like” names and there simply wasn’t anything close to matching up with the known family members and these dates. I searched for each child under multiple spellings, but came up empty. As much as you may not want to do it – you have to look at each and every one of the records offered. Out of the 5 records that I found on Ancestry, four stated Wigan, Lancashire, but only ONE listed the actual church as All Saints in Wigan. Why is this important? There are over 400 parishes in Lancashire, and over 30 churches within the parish of Wigan, so knowing exactly where the record came from gives me a starting point. I want to pull the film of the originial records and see them for myself to make sure the information is right, and I want to search that churches records for other family members. As it was, I still wound up going through all 30 churches looking at every birth, marriage, and burial record for all spellings of the name before writing this post. Notice the original contains a birth date that matches his tombstone and it also states he’s the 3rd son. I have him as the fourth son, but I don’t get too excited about the numbers. Sometimes they’re right and sometimes they aren’t. They are generally useful in at least telling me that this is not a first child, which can be a discriminator if you have two sets of parents with the same names at the same time in a parish. In this case, I definitely have the right kid, with the right parents, and an occupation for the father that matches the passenger list. We’re in the right place. I spent a good bit of time searching the online parish records and comparing the records found on Ancestry to those on Family Search and those on the Lancashire OnLine Parish Clerk Project. I encourage you to do the same thing. Many of the records found on Ancestry were Bishop’s Transcripts. In the research I did, I found mother’s names that did not match the original records (they did match the record above them in each case) and missing child numbers (2nd son 3rd child of) and names left out – a small number of years in one parish provided the name of the wife’s parents in the baptismal record which took us back another generation. If all I had used was Ancestry, I would have missed out on a lot of information – always check the original records. It appears Jane had a twin sister. The family is full of twins so this comes as no real surprise. However, once again, without the online parish records, I would likely have missed this. 5. Henry/Harry, born about 1826 was not found in any records or by any other name. William appears on the records first as a weaver and then lastly as a miner. A change of occupation is not uncommon – I found one man with four different occupations, but he’s the only man with that name in that abode. Once again, I’m confident that the weaver and the miner are the same person based on the fact that this is the only William and Ann Brimalow/Bromilow/Brimelow in the parish of Wigan during this period. While here, we need to talk about location because it matters. We have a tendency to think that our ancestors didn’t move much until they made “the big move” either across the pond or across the country. The truth is that some of them moved frequently if not a great distance. Our Brimlow line proved that in within New York City and Brooklyn, and they were the same way in Lancashire. Below are three items. 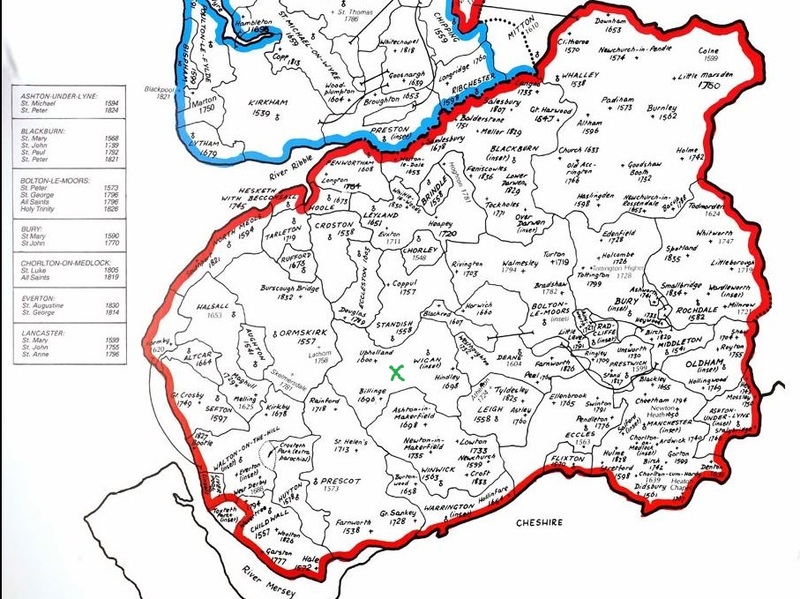 First is a map of the parish locations within Lancashire and some of the older churches within those parishes. After that is a pin map of all the locations I found people within this family group, including William’s brother, parents, and grandparents. Yes, I know who some of them are and that post is coming. 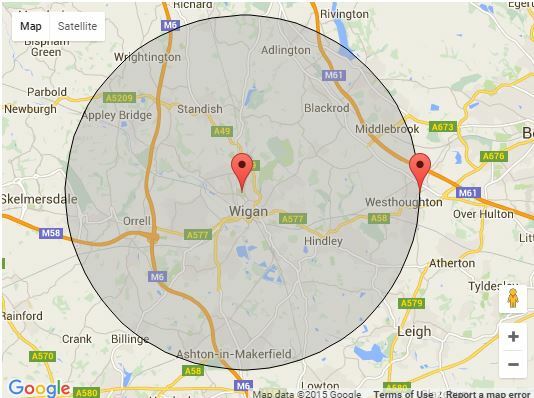 Finally, there is a map that shows Wigan (where my search began) with a 5-mile radius circle. 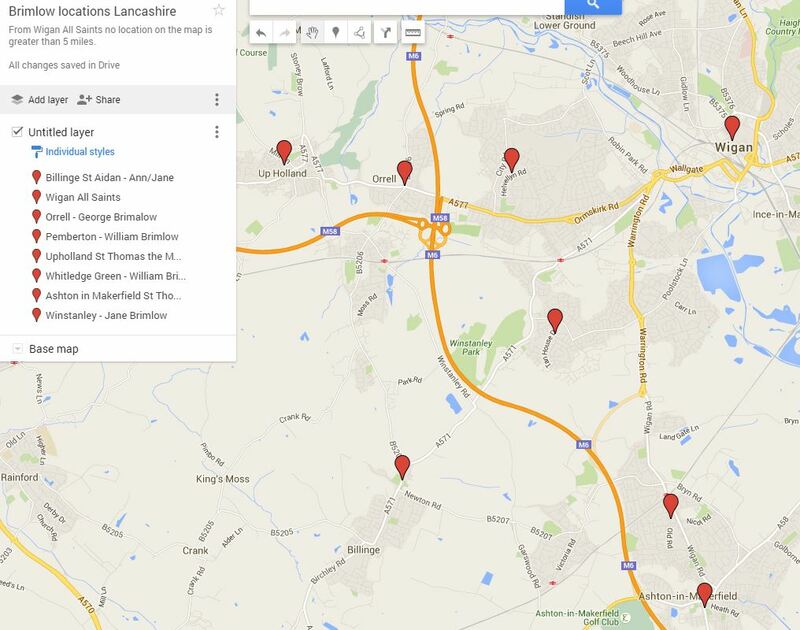 All of these locations are within 5 miles of Wigan. Why baptize a child in different places? When you are walking to church with a baby in arms and a 2 year-old on your hip – the closest church wins. So look for records in all the area churches and use all the spelling variants. 1. Marriage Record, Wigan All Saints Lancashire, Marriage Registers 1816-1819 p258 entry 773, 5 Sep 1819 William Brimalow to Ann Chaddock, Witness James Ainscow, Saml Vizard, Curate Edwd Hill LDS Film 1885691. 2. Lancashire, England, Births and Baptisms, 1813-1911, Ancestry.com, John Bromilow, baptism 2 Nov 1829, Wigan, Lancashire, son of William and Ann Bromilow, Bishop’s Transcript. 3. Christening records (accessed 5 Dec 2015), All Saints, Wigan, Lancashire, Baptismal Registers 1827-1830 p.213. John Bromilow, born 25 Oct 1829, bap 2 Nov 1829, 3rd son William & Ann Bromilow, Pemberton, Miner. 4. Burial Record, St Aidan, Billinge, Lancashire, Burial Register 1813-1851, p28, entry 221, Margaret Brimelow, burial 3 Feb 1823, age 2 days, abode Winstanley. 5. Christening records (accessed 24 Nov 2015), George Brimalow, b. 12 Feb 1820, christened 2 Apr 1820, 1st son of William and Ann Brimalow, abode Pemberton. FHL Film 94,032. 6. Christening records (accessed 27 Nov 2015), St. Aiden, Billinge, Lancashire, Baptism Registers 1813-1840, p64 entry 511, Jane Brimelow, bap 9 Mar 1823, dau of William & Anne Brimelow, abode Winstanley, occ. weaver. Twin Margaret Brimelow buried 3 Feb.
7. Burial Record, St Aidan, Billinge, Lancashire, Burial Register 1813-1851, p28, entry 221, Margaret Brimelow, burial 3 Feb 1823, age 2 days, abode Winstanley. 8. 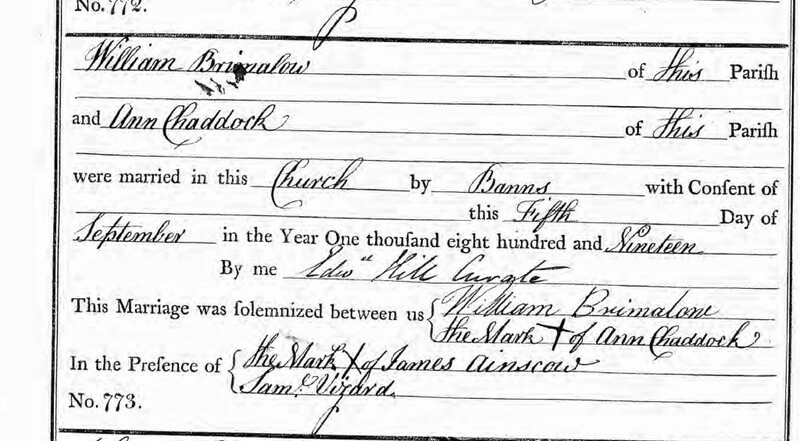 Christening records (accessed 5 Dec 2015), St Thomas, Ashton in Makerfield, Lancashire, Baptismal Registers 1813-1827, p 230 entry 1835, William Brimelow, bap 19 Jul 1825, born 8 Jul 1825, 3rd child & 2nd son of William & Anne Brimelow, LDS Film 1885658. 9. Christening records (accessed 5 Dec 2015), All Saints, Wigan, Lancashire, Baptismal Registers 1827-1830 p.213. John Bromilow, born 25 Oct 1829, bap 2 Nov 1829, 3rd son William & Ann Bromilow, Pemberton, Miner.